This soft and cuddly Big Eyes stuffed baby turtle, is bursting with personality and is ready for adventure. With soft lime green fur, darker green shell, big green eyes, and a sweet, smiling face, this Big Eyes plush baby turtle will delight those of all ages who love turtles, whether they are stuffed turtles or real ones. This turtle is my surrogate child. I'm a grown adult. I have no shame. Seriously so adorable. 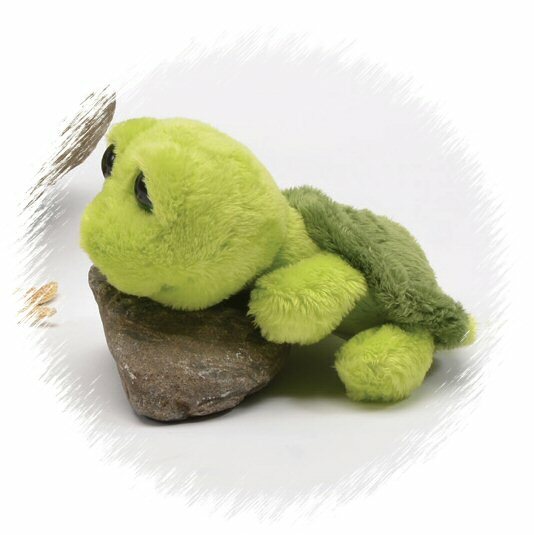 This soft and cuddly Big Eyes stuffed baby turtle has a soft yellow body with a brown shell and big green eyes. Encourage nurturing play with this adorable set of Big Eyes plush turtles that are oh-so-soft to the touch. Tricks, this Dreamy Eyes stuffed turtle, has a soft lime green body, an amazing dark green shell, and big sleepy yellow eyes. This adorable CHARM IT! Turtle charm is 3-dimensional fun with a green enamel body, black enamel eyes and sweet smile. This adorable CHARM IT! Baby Turtle charm has a fun green body, slightly glittered green shell, and sweet smiling face. This customizable Turtle fabric wall art is a wonderful addition to any pond, countryside, or other outdoor themed room.